Where can I recycle tetrapaks? Talk about hanging my head in shame. Yesterday morning we had porrage and raspberries with a smoothie made with the rest of the raspberries. For lunch Little Miss Green had egg sandwiches and instead of mayonnaise I used half of the whipped cream. For tea, Little Miss Green hoovered up seven pancakes made with goats milk. In three of them she had lime juice and agave syrup, in two she had left over egg ‘mayonnaise’ from lunchtime and for pudding she had two pancakes with stewed apple and the rest of the cream. While I had more leftover veg with fried rice. That was pretty good for the first day. We got through a lot of leftovers and didn’t create anything else. This is the big one for me, trying to use up old stuff without creating anything new. With the lime juice, for example, I squeezed the whole lime but it was too much for the pancakes. I was about to store the remainder in the fridge, but knew that was asking for trouble. So I poured it into a glass of water for Little Miss Green to drink – she loved it and asked for more <rolls eyes>. The egg mayonnaise I made at lunchtime was too much – Little Miss Green asked for three eggs, but could only manage two. I thought the remaining would be left in the fridge, but decided to use it up for tea. Today I will focus on the meat and dairy – the cooked beef, sausage pie and milk need getting through. I don’t mind cutting bits of mould off fruit and veg and eating what is left, but I won’t take chances with meat. The humous is looking pretty scary too – it was a home made batch and Mr Green isn’t that keen on it, so I might have to disguise it in a pie or something. Humous pasties anyone? I might cheat with the ginger and just grate it up and freeze it. It would be a big curry sauce making session to use it all up, as it’s quite a big piece. I’ll see, Little Miss Green likes all sorts of weird and wonderful things to drink, so perhaps she might like ginger tea with lemon in it. That would be lovely and warming for this time of year. It was interesting this evening. Mr Green was rummaging through the cupboards looking for something curryish. We nearly went out to buy something, but he settled on the shepherds pie with added curry powder. If we weren’t doing this challenge I know that the shepherds pie would still be in the fridge and we would have gone out to buy a tin of curry (the butcher isn’t open on a Monday). This showed me how easy it is to create food waste just because we don’t fancy anything. But with a little spicing up or added flavour we can soon create a meal we enjoy. So far so good. I’m feeling quite inspired. How are the rest of you getting on? Mrs Green’s 3Rs stories of the week Introducing a greenhouse made from rubbish! 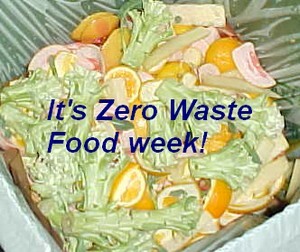 Food waste Friday It's food waste Friday! How much did you put into landfill this week? Sign up to my course and get 75% off! I am a long time supporter of the Green and Sustainable lifestyle. After being caught in the Boscastle floods in 2004, our family begun a journey to respect and promote the importance of Earth's fragile ecosystem, that focussed on reducing waste. Inspired by the beauty and resourcefulness of this wonderful planet, I have published numerous magazine articles on green issues and the author of four books. Its amazing what you can concoct. I have seriously reduced down our food waste over the last 3 weeks and find its better financially and waste wise to have less in the fridge, that way things do not get over looked. I have been running the freezer down too. We have a juicer so fruit/veg that is not going to get eaten up in time get juiced. I love ginger and apple. Just a few suggestions for the stuff which has longer left. or make into banan bread/cake and freeze that sliced so that you just pull out ind slices as needed. tub double cream – whip it up and put blobs of onto a lined bvaking sheet, open freeze, then box up, can abe pulled out a blob at a time as needed for a dessert. For all 3 citrus you could make a marmalade using the 3 fruits and obviously scale recipe back for the weights. 1 cauliflower,cooked veg from sunday lunch ,cooked jacket potato, rice – these could all be mixed together to make a soup; I would add the potato in chunks nearer to the end so it held its shape and would probably also take out some of the cauli and blitz the rest then add back in the cauli with the potato. The milk could be used to make a cheese sauce, possibly using the cheese pate and that could be served with the cauliflower as “cauliflower cheese”. The beetroot could also be made into a chutney using some of the shallots as well; or just peeled and roasted in the oven with a splash of olive oil and some fresh ground black pepper, they take approx same length of time as roasties. Could the hummous be added into one of your curries to give some thickening, depending on what you make it with ? Now looking at your list Mrs G, I’d be tempted to slice up that thin piece of beef and cook it with finely sliced shallots, grated ginger with the juice of the orange, to make a fruity number. Add some mango chutney\tomato puree if you got some as well as some spices such as chilli or paprika. Add some cream to taste and a sprinkle of pepper, with a good spoonful of luck, hee hee. Serve with your mixed vegetables and rice. You can always add more rice if you need to. I went through my fridge yesterday, not as much to throw away as I thought. Mrs A, Rubber Chicken is one of my favourites. All I have in the fridge as I type are some jars of jam and chutney some mayo; 2 lots of easi-yo yog that the boys eat,fruit and jelly again for the boys, tomatoes & cucumber, some grated cheese, cream cheese and some chocolate for baking. In the veg rack I have some carrots,leeks,red onions,beetroot,white aubergine and potatoes. All of which will be used within the next couple of days, and my new veg box comes tomorrow. I do have 2 cupboards with tins and packets and 2 freezers with all sorts in but they all get used by rotation and are my “mini shop” which I can go to for things. My fridge is run down to the emptiest it’s been for some time – and tonight we’re out for tea. The plan for tomorrow is to coolbag up the contents of the fridge and give it a serious clean, and I’m reasonably confident everything can go back. Most of a head of broccoli, which my husband has declared he’s fed up of and not enjoying. I think it’s destined to go into cheese sauce for excitement purposes. 3 or 4 leaves of the exciting russian cabbage the very organic people sell at the Farmers Market. I’ve been chucking a few leaves in with most meals so expect that to be gone tomorrow. A tub containing half a tin of Lidl’s garlicky ravioli – lunch tomorrow for me – yum! Mint Sauce – possibly out of date but since it’s a vinegar suspension not something I worry about hanging onto! for meats to be safer longer i use an old French trick..
put a rosemary sprig and/or bayleaf at last stage of cooking. meat pate is a handy spread, chop any meat, add herbs and enough fat to make it spreadable on canapes or mini sandwiches. mayonnaise will make the cooked meats more blendable. sage, thyme and yes rosemary, the three antibacterial/viral companions are good keepers, onions and garlic add to that. texture may be smooth as salmon mousse or chunky as pork chop leftovers. the blender or the cook will determine the effect. add olives and parsley on top of open face bread rounds and see a whole new life to bits and pieces., just be sure vto blend by color…white meats–red meats–fish meats. sorry to have to segregate the critters and the fritters, but for the sake of cross contamination, it is a biological and culinary must. as for the marmelade recipe i have one on the Helium site and greenadine too. happy salvaging dear food chainers. My day two post is up! Not bad! Bob is working from home so should give me double chance to use up stuff. He actually can’t GET to work as the freeways are closed due to the fires. The firefighters managed to contain the one near us, but there is still one near us and another to the east that is 70% contained. Thankfully the winds died down and that gave them the break they needed to get ontop of it all! At least the falling ash is good for the garden! Good job! I do the same thing…taking stock of what’s in my fridge and what will need to be eaten soon. Thanks for all your great ideas, Maisie – I have been using some of them. Getting through fresh bananas isn’t hard as we now have smoothies most days. Made with 3 fruits, this is a good way to ensure LMG gets her 5 – a – day. I never knew that about double cream, but that’s fab and will work perfectly for Sundays when my two like to have cream with their pudding. It also means I can buy cream on offer and freeze it. Mrs A – your idea for the beef sounded great – thing was, when I went to make it, Mr G had already eaten it with his lunch LOL! I’ll bear it in mind though, as we are often left with just one or two slices of beef after Sunday. Hope the yogurt wasn’t too furry. Di, I’ve been following your progress over on your blog. You inspired me to turn half of the cauliflower into gobi aloo! How is everything with the fires over there – are you ok? Hi Nadine, some of the properties of herbs are amazing, aren’t they? Thanks for the reminder about this. The meat pate is the sort of thing Mr G would bite my hand off for. I’ve never made it, perhaps I should have a go……. It would him and the cat fighting for it though; I fancy her chances more than his! Kristen; I have loved reading your posts about food waste, you’ve certainly helped me to think things through differently and you’ve done so well with your challenges. Yep I love Gobi Aloo, I froze a portion this time just to see how it fares. Honestly it could turn to mush and I’d probably still eat it! lol! I can still smell smoke a bit, but can’t see it anymore. The firefighters have it 70% contained now so pretty much under control thank heavens! Glad the fire is contained, Di. You sound like me, I don’t really care if something turns mushy as long as it tastes good. Thankfully, Mr Green is like that too – I can serve him up pretty much anything and he’ll eat it. Hope the soup was good. Does it count as food waste if you feed it to the chickens and they recycle it back into eggs for you? How about scraps put into the dehydrator and made into crunchy dogs snacks? I often find myself battling with whether to make a vegetable stock or to feed those scraps to the birds — it usually depends upon how much grain I have on hand, as I like to give them a treat every day. I love your question; I wouldn’t see feeding food to chickens as ‘food waste’, nor dehydrating it for the dog – that’s really resourceful and it’s being used as ‘food’. I guess composting it is making use of it too. We were trying to get away from letting things go past being good enough to feed anyone – be it a two or four legged animal – and also trying not to compost stuff that should otherwise have been used up. © 2019 MY ZERO WASTE. All rights reserved. My Zero Waste.com.